Acupressure & Shiatsu are similar versions of finger pressure massages. These techniques put pressure on certain points using the thumb, finger, and palm. Both forms of massage use the meridians or energy pathways of the body. Shiatsu is the Japanese version of Acupressure, however there are differences. The battle between Acupressure & Shiatsu rages on... who will win? Acupressure is a therapy developed over 5,000 years ago as an important aspect of Asian, especially Chinese, medicine. It uses precise finger placement and pressure over specific points along the body. These points follow specific channels, known as meridians - the same channels used in acupuncture. According to Asian medical philosophy, activation of these points with pressure (or needles) can improve blood flow, release tension, and enhance or unblock life-energy, known in China as "qi" or in the English-speaking world as "chi." This release allows energy to flow more freely through the meridians, promoting relaxation, healing and the restoration of proper function. The existence of qi and meridians is doubted by many Western scientists. They believe that any healing effect from acupressure is not due to the alteration of subtle energy flows along invisible channels, but rather to the same gross physical effects that happen during any kind of massage therapy, including muscular relaxation and improved regional blood flow. What should one expect on an Acupressure visit? An acupressure session is typically performed with the patient lying on a massage table, though it can be used in conjunction with exercises such as tai chi or qi gong. Typical sessions last 90 minutes and are often done in conjunction with other forms of massage therapy. The recipient should wear comfortable, loose-fitting clothing, such as that typically worn while exercising or doing yoga. Slow, full, deep breathing is often encouraged, especially with pressure applied to points that cause discomfort or that the practitioner regards as having blocked energy. Guided imagery or visualization is often added to allow further relaxation or movement of energy to and through pressure points. Following treatment, a practitioner may ask for feedback and offer home exercises or self-care. Because energy work of any kind can cause profound relaxation, care should always be used when rising from the table and returning to a standing posture, as the leg and trunk muscles may feel weak for a time. You can also use it on your dog & they will love you even more. The purpose of acupressure is to ease muscular tension. Acupressure allows the blood to circulate freely, removing adhesions in the muscle tissue (fascia), enabling toxins to be emitted or removed, and allowing the nerves to rest. Emotions can be stabilized through acupressure by venting the related tension stored in tissue by suppressed feelings. Acupressure also helps upgrade muscle strength, tone & helps sports injuries by increasing circulation as well as lowering pain. Acupressure is a safe alternative to problems associated with stress such as headaches, ulcers, cramps and insomnia is acupressure therapy. 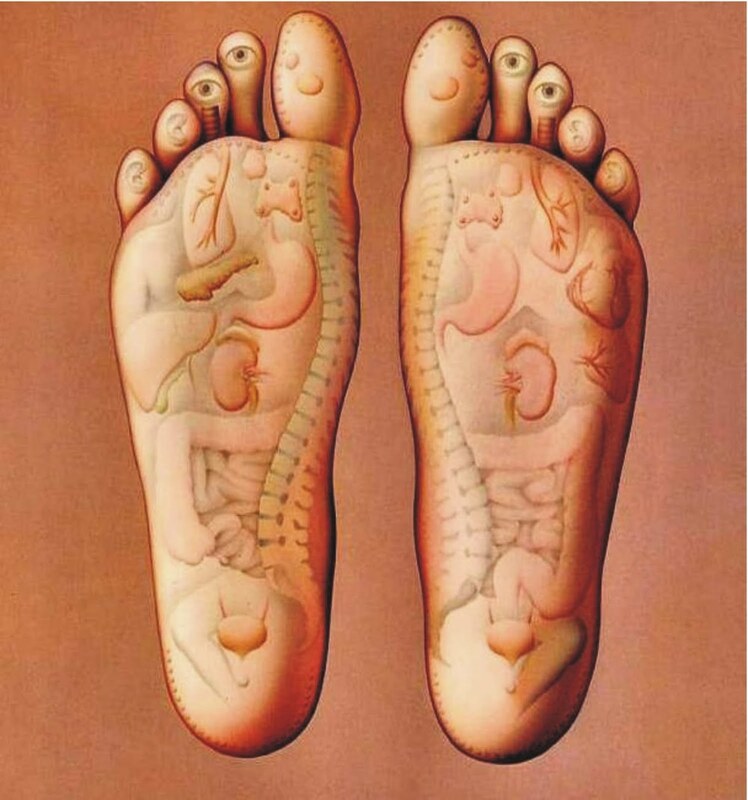 Acupressure techniques are meant to correct imbalances in all systems of the body, by regulating these systems. Acupressure is different from Acupuncture in that it is performed without needles. The practitioner uses his or her thumbs, hands, and knees or elbows where needed. Glands become stimulated once pressure is applied in that region. There are fourteen invisible meridians in the human body that carry energy throughout the body. These meridians begin at the fingertips, and are attached to the brain and the related meridian organ. A barrier in the meridian causes the energy to flow slower, which in effect causes something to go wrong in the organ, which is related to that meridian. (Think of it like debris on the freeway, inducing a traffic jam in the body) Through acupressure the energy can flow with regularity and the organ can continue its usual function (by removing the debris. Acupressure reduces pain by stimulating the release of endorphins, which are the body's pain relievers. Acupressure also raises the nutrient supply to muscles by advancing cellular exchange. What your feet look like from my eyes... or from eyes of Acupressure. There have been many claims made about the effectiveness of acupressure. Acupressure also is productive in problems that associate with the major organs of the body such as the liver, stomach, digestive organs, kidneys and the brain. Diabetic patients find that through acupressure, their sugar level is considerably lowered. Acupressure has also been known to aid in PMS, infertility, menopause, pregnancy and urinary problems by avoiding hot flashes, depression, hyper-tension and aches. Acupressure does not only ease the pain, it actually heals it internally. Bone fractures and dislocations have been corrected through acupressure rather than casts. Acupressure has removed kidney and bladder stones in just days. It has cured Colitis and Chron's disease. In most cases, the first stage of cancer is 100% curable, the second is 70% and the third is barely ever curable through Acupressure. Remarkably, Acupressure has also helped cure breast cancer, as well as paralysis, arthritis and rheumatism. Other claims are that acupressure replaces chemical influence on the body, which means people don't take as many prescription or non-prescription drugs. There is no danger of infection since acupressure does not go beneath the skin. In support of all these claims, scientific equipment has shown that these points used in acupressure have a higher electrical conductivity on the surface of the skin. They have found that acupressure should not be used as your only form of treatment for illness; you should see a doctor if you are sick. Acupressure is not to be used by those who are pregnant or suffer from a heart condition. Scientists have also found that acupressure should not be performed 20 minutes before or after extreme exercise, a big meal, bathing or if the point is beneath any sort of break in the skin. Shiatsu is a very similar to acupressure, however it is somewhat more elaborate. "Shi" means finger and "atsu" means pressure. Shiatsu involves more techniques such as pressing, patting, rotating, pinching, vibrating and many more that are not necessarily used in acupressure. The purpose of shiatsu is to toughen the immune system. Shiatsu is known to be beneficial in injuries of the soft tissues. For example, sprains, strains and aches of the back or shoulders can benefit a great deal from shiatsu. Shiatsu effects the circulation and flow of lymphatic fluid by helping the autonomic nervous system. Through the process, toxins and tension are freed from the muscles while rousing the hormone system. It helps with headaches, menstrual problems, digestive problems and backaches. Following an injury, shiatsu may be used to quicken the recovery. Quickened recovery occurs because shiatsu raises blood flow to the struck areas and lessens irritation and expanding of the joints. Shiatsu also relaxes a person and allows them get in touch with themselves. People feel composed and serene after shiatsu. Shiatsu works by exciting the chi flow similar to the way acupressure does. Shiatsu does not only consist of putting pressure on the body to make it work at its best, but there needs to be communication and understanding between the person receiving the treatment and the person giving the treatment. Chi stagnation is when the energy flowing through us, which nurtures our insides, is blocked. Shiatsu then enhances the flow of energy and removes the blockage of the chi. Stagnation of chi can be a result of too much work, confined exercise, trauma, stress, lack of sleep and bad posture. Some symptoms of stagnation include muscle sprains, PMS, headaches, high blood pressure, lower back pain and anxiety. Slight pressure is put on the meridians usually found on the legs, head, back, abdomen, neck and arms. Also, the body needs to be extended to ease muscles and joints. Classic shiatsu is good for balancing muscle tone. Deep shiatsu is a combination of stretches & compression's which works well for pain relief and putting you in a very relaxed mood. Tantric shiatsu and Jim Shi Do shiatsu are gentle squeezes that are for sensitive people. Watsu shiatsu is a treatment that is done in water, which assists people who are going into a deep meditation. Bon shin - examine the shape and color of the body. Shiatsu reduces pain, improves circulation, relaxes the nervous system, helps your muscle condition, improves your skin, and raises your metabolism. Shiatsu also has many psychological advantages including meditation, assisting people in seeing patterns of behavior, providing balance, & getting in touch with their inner self. Both acupressure and shiatsu are oriental methods of massage therapy. They both use chi, meridians, and pressure points to perform techniques. They are good methods for relaxation, easing pain, improving self-awareness and just becoming a healthier person overall.